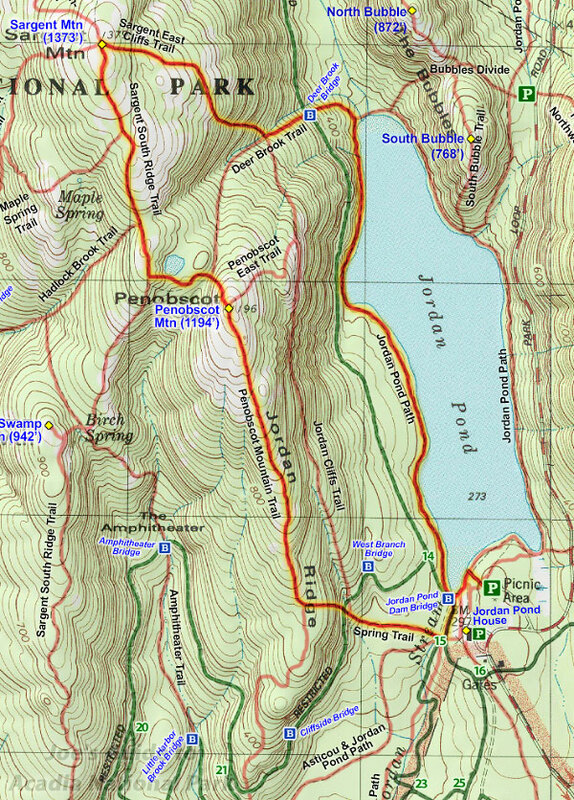 With its tall and exposed cliffs looking down on Jordan Pond from the west, Penobscot Mountain (the 5th highest peak in Acadia) is the impressive north-south mountain that sits opposite of Pemetic Mountain in the Jordan Pond/Bubbles pantheon. A hike up Penobscot Mountain via the Spring Trail makes for a strenuous and invigorating hike with incredible alpine views. And those looking to extend the adventure can continue hiking north to the taller neighboring Sargent Mountain (the 2nd highest peak in Acadia). 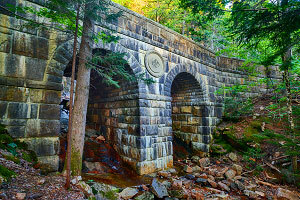 As a bonus to bridge hunters, this loop hike also crosses several carriage roads and offers easy access to see three of the beautiful carriage-road bridges. Rating: Strenuous day hike with some exposure. Elevation Change: 940-ft elevation gain up Penobscot Mountain; 360-ft extra up Sargent Mountain. Park at the Jordan Pond North parking lot, located along the Park Loop Road roughly 3.7 miles south of the turnoff for the Cadillac Mountain Summit Road. (This section of the road is two-way.) Limited parking is also available in the smaller Jordan Pond House parking lot. (Both lots tend to fill up and be quite crowded on summer afternoons.) From the Jordan Pond North lot, walk northwest to the boat launch and then turn left and follow the shoreline path to the southwest corner of the pond. Follow the carriage road south and within a few moments, you will see the Spring Trail trailhead marker. The Spring Trail crosses Jordan Stream and heads west through the thick forest under Penobscot Mountain. Soon enough, the trail crosses a carriage road and bridge hunters may want to take short diversion hikes along the carriage roads to see the two in the area. .2 miles to the north is the 115-ft long West Branch Bridge with a tall, narrow arch that allows a small stream to pass underneath. .4 miles to the south is the amazing Cliffside Bridge, a 230-ft long structure built out of the side of the mountain in the style of an old English castle. Back on the Spring Trail west of the carriage road, this is where things get interesting. The clever trail heads up the steep cliffs by zig-zagging back and forth through the narrow cliff bands. 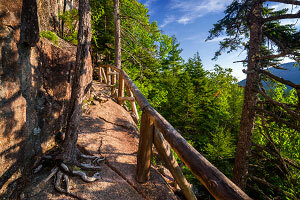 A few iron handrails and thick log fences aid hikers along the way. While this isn't officially an iron route like the Beehive, the exposure and steep grade could be intimidating to some. Soon enough, the trail surmounts the initial cliffs and the ascent mellows out. At the junction with the Penobscot Mountain Trail, turn right (north) as the trail slowly heads up the spine of the mountain. The scenery along this stretch is wonderful with the sparse vegetation offering open views of Jordan Pond and the Atlantic Ocean far in the distance. The pink granite formations are some of the most interesting in the park with many grooves and wave patterns carved out by glaciers and there is even a bog near the summit, created by trapped rainwater. After you have bagged the summit of Penobscot, there are many options for completing the loop, including descending the Penobscot East Trail and the Deer Brook Trail and then taking the carriage road or the Jordan Pond Path south back to the parking area. But if you want to extend the hike another hour or so, Sargent Mountain (the 2nd highest peak in Acadia) beckons to the north! To reach Sargent Mountain, descend Penobscot to the north into a small forested valley. As you ascend the other side of the valley you will pass an enchanting isolated pond before joining up with the Sargent South Ridge Trail. Turn right (east) towards the summit; the scenery is very similar to Penobscot Mountain, beautiful but somewhat barren scenery like the Scottish highlands. At the summit of Sargent Mountain is the junction with our return trail. Take the Sargent East Cliffs Trail east as it descends the mountain heading back towards Jordan Pond. This section of trail may be a bit intimidating as several seeps create several slippery sections along the steep trail. The next stretch, the Deer Brook Trail, is a fairly rugged trail that follows a small stream; many exposed tree roots will try to trip you. At the junction of Deer Brook Trail and the carriage road is another wondrous carriage-road bridge, the Deer Brook Bridge with its two arched spans and distinctive streaked rocks. From this point, you can either continue down the trail to the scenic Jordan Pond Path or if you want the easier and faster route, you can hike the carriage road south back to the Jordan Pond House and parking areas. Spring Trail to Penobscot Mountain and Sargent Mountain is a terrific, albeit strenuous, loop hike. 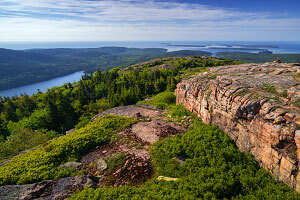 Thrilling Acadia peak views, carriage-road bridges, and a return stroll along Jordan Pond make this a great adventure.